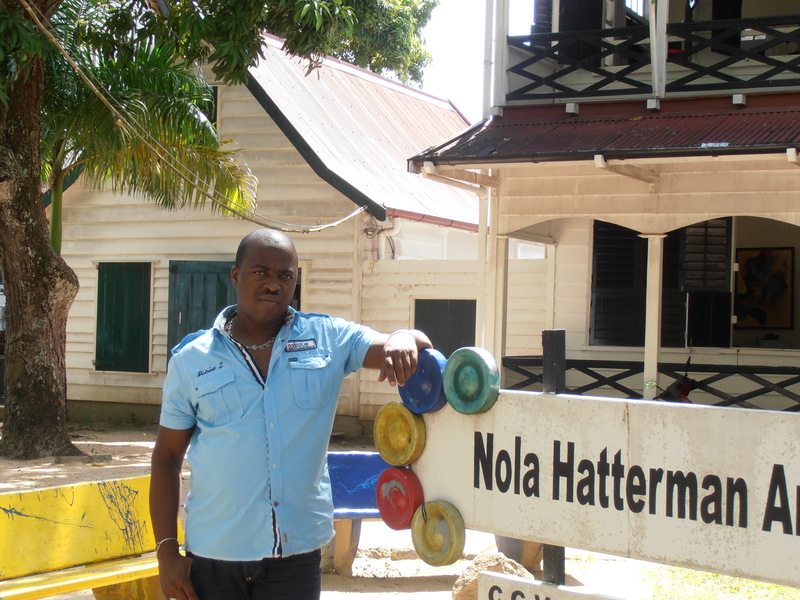 Chris Morvan interviews the Surinamese artist and director of the Nola Hatterman Art Academy Marcel Pinas. Like all forms of culture, art tends to be found in cities, but the place we find convenient to work is often not the place that formed us. It doesn’t, of course, make an artist any less ‘legitimate’ if he or she appears as if by magic in some commercial hub, but for some, a glib acknowledgment of their roots is not enough. Such a man is Suriname’s Marcel Pinas. To understand pinas and his work, it helps to know ae he comes from, and Suriname is a quite unusual place. Many people around the world have no idea where it is, because it is in South America but it doesn’t have a successful football team and it’s in the Caribbean region but has no beaches and little tourism. What Suriname does have is a troubled recent past. As recently as the early 1990s an internal guerilla war ravaged the country, with the Jungle Commando taking on the army. The rebels represented a group known as the Maroons, descendants of Africans brought to the country in the era of slavery by the Dutch, who ruled Suriname at the time. The Maroons were put to work on plantations, mostly close to the capital, Paramaribo, but many ran off into the interior, where there was and still is a huge area of dense jungle. There they established their own communities and reverted to the cultures of their homelands. Although the war ended in 1992, Suriname is still very much divided into the interior and the developed areas nearer the coast. The 21th century (or even the 20th) has still to make much of an impact outside the urban centers of Paramaribo and one or two smaller towns. Thus there is a huge amount of culture that never reaches the outside world. Marcel Pinas is a descendent of the Maroons, and he is determined not only not to forget it himself. But to bring his heritage to the attention of the international art community. 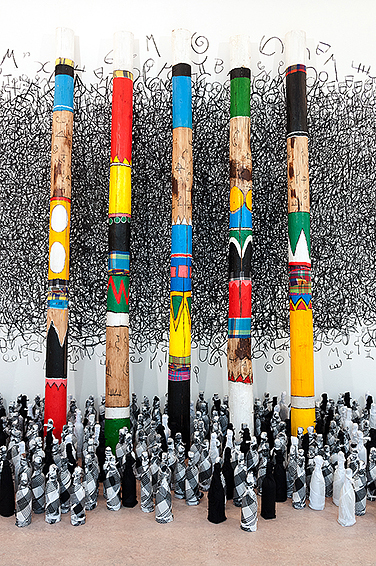 To this end he has established a little art hotspot in the small community of Moengo. 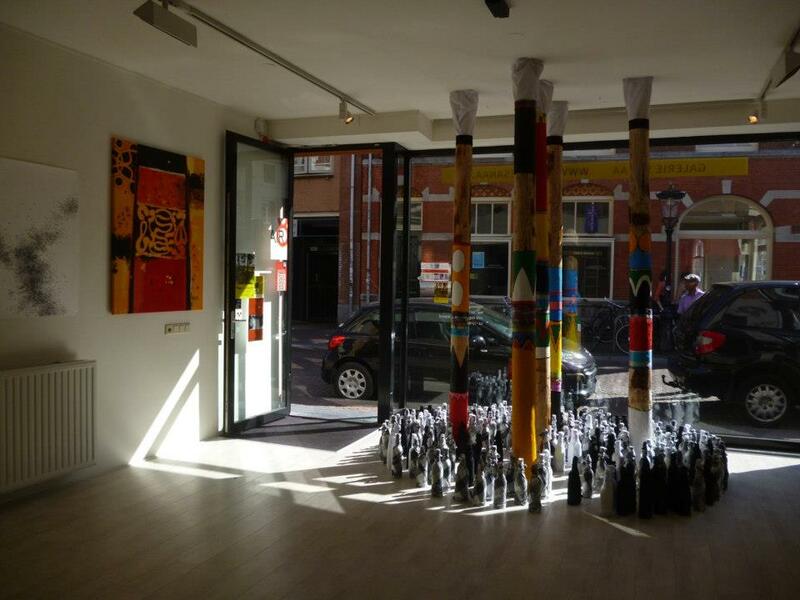 Installation View Galerie Sanaa, Utrecht. We meet, though, at the Nola Hatterman Art Academy, which is very much, the cradle of art talent in Suriname. Pinas learned his craft here and is now the director. It is a friendly wooden building with a ramshackle air that belies the fact that it was rebuilt only 20 years ago. The setting is Fort Zeelandia, once the center of military operations in Paramaribo, situated as it is on the Suriname River, where it could defend the town. The fort is now a quiet, leafy area, a welcome respite from the heat and traffic of the city. The students here learn, as Pinas did, the basic skills of drawing and painting, the platform on which they can build their own style. 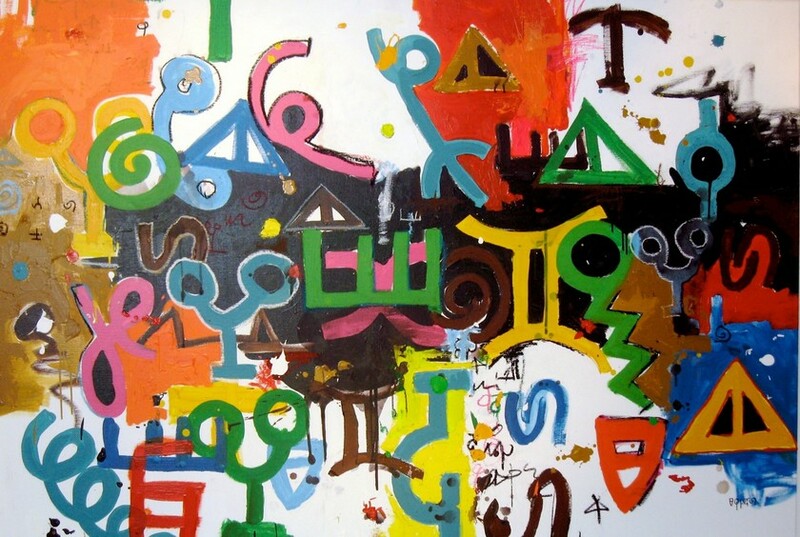 Pinas paints a downbeat picture of the prospects for artists in his country. So, having got himself established as a professional, Pinas could develop his own style. Is art in Suriname still all about hanging things on walls? When he was studying and seeking his own artistic identity, he had a sudden realization. He points to the silver symbols hanging from the chain around his neck. So those are the reasons why Pinas went back to work in Moengo. He is the figurehead of the Kibii Foundation, which was set up to bring new life to the region. 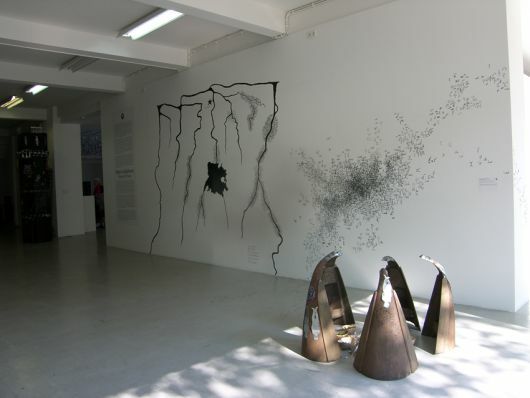 Installation View, Het Gemak, The Hague, 2009. As we saw before, though, with Pinas’ own development, there has to be a pragmatic side to it. A certain amount of funding is currently helping the Moengo project – the Dutch embassy funding artists, the Mondrian Funds and the Prince Claus Fund, but Pinas is unsure how long it will last. “So I am thinking about how to survive,” he says. He talks of working with companies based in the area, and there is now a restaurant associated with the project, which brings in a small but useful amount of money, and likewise a guest house with 12 rooms. Both of these new developments are a result of catering for the needs of the visitors generated by the art project. The whole project is far from grand, but there is a museum, a space for the artworks to be displayed and a rehearsal space for music, with instruments available to use. Next on the agenda is a recording studio. Initially the instruments were provided by Pinas, but he is gradually getting the project to stand on its own, and musicians now pay a small amount to use what they need. The museum is in an old building. “You have to make do with what you have, ”Pinas says. The art park itself is boosted each time a visiting artist comes, and there are now 13 sculptures,. The artists, who come for three months at a time, then work with children after school in three nearby villages. After a string of artists from abroad, the current incumbent is the home-grown talent of Razia Barsatie. “They have to be artists who can come here and work with what there is, “he says, meaning the lack of facilities and the difficulty of obtaining materials. 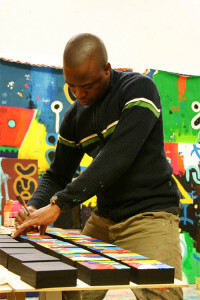 Pinas himself has done stints as artist-in-residence in, among other places, Vermomt, the south of France and Trinidad. He is a firm believer in travelling in that way as a means of building a network, showing work to new people and being exposed to new influences. 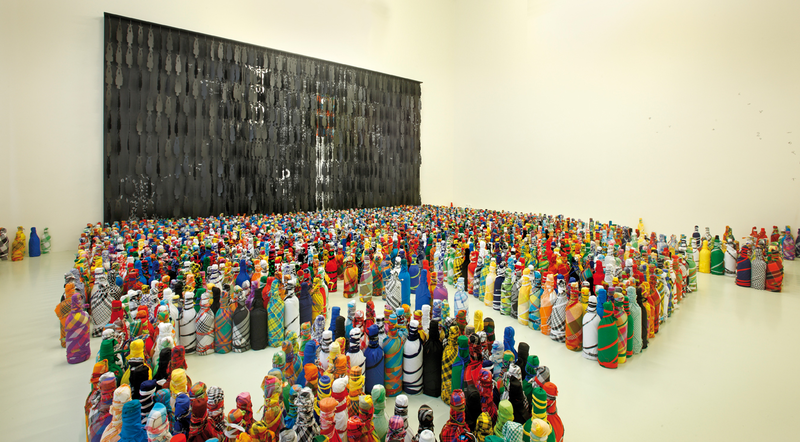 Installation View Kibi Wi Koni, Berlin. With the Moengo project taking up much of his time, he was in no hurry to follow in Rinaldo Klas’s footsteps as director of the Nola Hatterman Art Academy, and thought about it several months before accepting the post. That brings us back to the building where we are talking. It has a charming, bohemian atmosphere, but is it suitable for an art school. No, is the simple answer. It’s not big enough, lacking the space for dedicated areas for print-making, a ceramic workshop and so on,. As it is, nothing can be left set up – everything has to be cleared away at the end of a session. While full government funding is still some way off (although staff salaries and maintenance of the building are provided), Pinas senses a change of attitude, a growing realization of the importance of art and culture. A real danger for any artist who becomes so involved in organization and administration is that his art can be neglected, but Pinas has established a routine. The institute gets his full attention Monday to Wednesday until midday or early afternoon, after which he goes into his studio. He also works when in Moengo, and says he gains inspiration for his work from what is happening there.